The film Cosmopolis opens in U.S. theaters on Friday August 17th, 2012. The seductive trailers and amazing cast is reason enough to go see this film. But throw in David Cronenberg and Don DeLillo and you are in for a mind altering experience out of this world. However, for those venturing into the theaters without having read the book or seen any of Cronenberg’s films, Linked in Hollywood has put together a cheat sheet in case you want to brush up before or after seeing the film. To give you fair warning this material like the film is not for the PG-13 fairytale audience, instead it’s for the spirited audience, unafraid to confront the reality we live in. 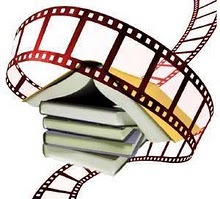 This article is a collaborative effort by the authors on LIH who did a wonderful job in defining (for our readers) how this film and text reflects our past and present. We hope you enjoy! In the film protesters are taking over New York City. For the sake of not spoiling the film we selected a similar protest taking place today. In Zucotti Park in New York’s financial district was the place where the first Occupy Movement began on September, 17, 2011. The people gathered to protest the greed of corporations, social inequality and the power of banks and corporations over the democratic process. The Occupy Movement does not have a leadership structure which makes it difficult for any of the protesters to ask for aid from State Legislature and Congress. Towards the end of the book Eric takes part in a large scale naked photo shoot (also known as human installation). 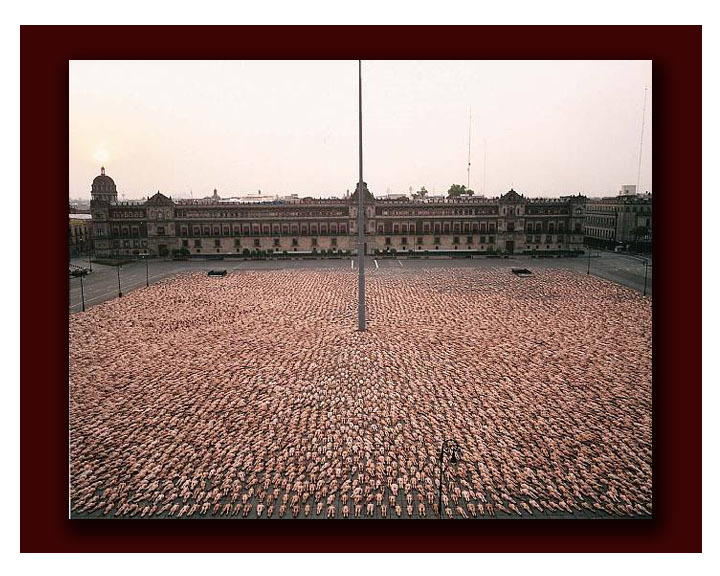 The artist is not mentioned but the best known artist of the genre in the world is Spencer Tunick. His career in naked photo shoots began in the mid 90’s in New York. At first these events had to be secretive and quick in order to avoid the police (Spencer has been arrested five times) but now that his work is well known, he has a little more time to perfect his shoot. His first large scale human installation was in 1994 with 28 naked people in front of the United Nations building in Manhattan. His largest to date took place in the main square (Zocalo) in Mexico City which featured about 18,000 naked people. Spencer’s aim is to highlight the contrasting nature between humans and their environment. Often the location is important and has a symbolic meaning and enhances the contrast. Please evaluate the following music samples from the Cosmopolis soundtrack through a lens of these characteristics. Do you believe these music examples pass the test and if not do they at least describe scenes or concerns from the book in a musical manner? If you think so you would probably be appreciating the work of David Cronenberg and the attributed musicians. Though not always similar to Kramer’s list Howe Records described most of the music this way, it is: “an atmospheric, urban soundscape of analog synths and layered guitars featuring the hypnotic vocals of METRIC lead singer Emily Haines.” Indiewire provided the creator to product attributions. In terms of music the book only discussed two characters that were music industry participants: Kosmo Thomas and Brother Fez. The former was a producer and the other was a rapper, you should decide whether you think one or the other has a factual or completely fictional correlation in the real world. To confuse that issue Don DeLillo actually contributes lyrics for rapper K’naan’s vocal performance for the album, METRIC accompanies instrumentally. Do you believe this K’naan performance meets Kramer’s or your own definition of a postmodern music? Also see: Cosmopolis: What’s your favorite quote? ← Cosmopolis: What’s Your Favorite Quote? Man, this is a lot to stuff. To read the book, I never felt overwhelmed yet some times I did have to remind myself to be patient. I can’t wait to see the film. From what I have read, though technically not on the film soundtrack, the band “Nine inch nails” did produce this song in relation to the film. CR- I like 9″ nails & Mecca the best. From what I have read, though technically not on the film soundtrack, the band “Proxima” did produce this song and video in relation to the film also. I like this one too! This should be my theme song. hahahaha! Yes! This material is quite overwhelming, which can also be said about the world we live in. It definitely requires an open mind and eyes to fully recognize and appreciate this films integrity. Paris, LB, Ozzie and CR very, very, impressive. This is my favorite article so far! Welcome to our discussion tonight. Did any of u know anything about the topic u wrote about prior to reading about it in Cosmo? Also, did u learn anything more (about the topic) but did not include in your submission? I had seen photos before but I didn’t know any of the details like who it was by and what they were trying to express. All I knew was it was art! I pretty much included everything I learned into my part. The things I left out was “filler” like how he met his wife or little anecdotes about friends and colleagues etc. I’m still learning stuff. The book is incredibly rich and fortunately he chose to collaborate with contributors that were exceptional for this venture. I will attempt to be more specific later. Actually I do notice similar styles in Postmodern music and literature. In this way DeLillo really stimulates all your senses with this story. Have u ever seen any of ST Art work in person? No. Just in books, magazines and the internet. I did find out he did one in my region though! I knew about the artist yet I become more impressed with him every time I seem him. It’s hard not to get involved with the novelty or titilation end of the work when you first see it. Ozzie & CR-What genre of Visual Art do u prefer? Modern or Post Modern? I’m a POMO too. Of course!! It’s the era we live in. I learn the most from the work. I had a general question…. Since this is DeLillo’s first feature film contribution it’s difficult to define either expectations or inconsistencies for him in film development. Ozzie did an excellent job of defining what we might expect of post-modern literature, so does anyone see similarities in Cosmopolis and other films we will be seeing in the Cineplex’s in the near future? Great Q CR! I certainly hope it sets a trend in mainstream films of having substantial and poetic dialogue. This is my dream! This may be a question for LB but given u did a wonderful article on Postmodern Literature maybe u can answer this one for me. What differences and similarities are there between postmodern poetry and literature? Sorry, computer problems. It’s still being bad! When I was researching that article, I did come across postmodern poetry but I didn’t look at it, lol! I was going to but then I thought although it does come under literature, it was a different sub section to stories. So I made the decision to stick to to just stories to stop it from being over whelming for anyone who reads it. I would of thought it would be a similar format to stories though. Thanks Oz! I actually love postmodern poetry and I find them (at least the ones I love) to use a lot of dark humor, irony and historical fiction elements to them. Ozzie! I found your research spot on and it really bleeds into other arts as well. When you started the series you were very bold to begin tying Cosmopolis to a lot of events in contemporary politics. Even Cronenberg appears to be cagey or possibly elusive about some of those associations. Can you define an ARTISTIC reason he sometimes may have appeared that way in interviews. Well I would not say DC is elusive but perhaps that’s what it appears like to some.However, like most Artist u do the work and u want audiences to participate and interact with your work. In other words u want them to express what your work means to them on a personal level. So most Artist don’t like to put u or their work in a box or put limitations on it because people are complex just like this material DC & DeLillo have created. Does that make sense? Well I don’t believe he is elusive in that clip. She doesn’t even ask about the political influences, yet I’m sure you have seen interviews (maybe written ones) where he doesn’t really volunteer the Occupy movement references. I’ll agree with you he doesn’t deny them either and in many ways I think I could hear him embrace them. In some of the interviews I think he appears to suggest that these concerns just happen to get expressed simultaneously. Regardless, in some of the movies like “Crash”, “Eastern Promises,” and “A Dangerous Method” he is demonstrates an almost peerless dedication to detail when addressing historical material. I was hoping you might speculate on what you think, as a director, Cronenberg might be considering regardless of his personal beliefs, and business concerns given his incredible career. LOL! Me Speculate and Assume? hahahaha! I’m allergic to those words CR! Didn’t you feel you were taking a big risk,(with the political interpretation), given the reputation of the director and the popularity of the actor? No I was compelled more by how observant DeLillo was of society/politics during the time he wrote Cosmo and how it parallels what’s happening today. The range of his past movies is really dynamic yet I’m wondering what David Cronenberg is doing in the realistic drama department? In as much as he does fantasies “Naked Lunch” or “The Fly” he never really played by the rules. These stories were sometimes sexual, adult, and if you have a weak stomach a little disturbing. The last few realistic drama’s I have seen him direct seem to be fairly straight forward “Eastern Promises”, “A Dangerous Method” and now “Cosmospolis.” Meaning they don’t seem to break any laws of realistic story telling….. except this performance doesn’t appear to be his style at all!!!! Sometimes called a master of the Cinema Extreme, can anyone name any distinct ways Cronenberg may have sustained his penchant for rule breaking? I think Naked Lunch & Cosmo are sorta similar. I mean they are both Dark Humor and adaptations. Are you saying Burroughs and DeLillo have a lot in common. Please explain. Let me see? Burroughs is more surreal and very absurd. I think Cosmo has some dream like qualities especially at the end of the book. So that’s why I find the two to be fairly similar. Paris-Have u seen Naked Lunch or read this book? I can’t really answer that. The only film I know I’ve seen definately is The Fly and to be honest, I still hid behind cusions! I may have see his other work and not known it was by him but I’m kind of scared to watch his other work. I am a highly squemish person, lol! Ah! Ozzie u are not alone. I’m not that big of a horror fan. But DC I can watch because his films are more psychological thrillers. I think Crash and Eastern Promises are more mainstream. Naked Lunch is really out right funny and out there crazy! If any anyone has any thoughts I would love to hear them. By coincidence or not a lot of actors seem to define themselves within genres. I think of all of the science fiction that Sigourney Weaver has starred in. There is the wide range of comedy’s starring Jim Carrey. I can imagine people claiming Jennifer Aniston is the contemporary queen of Rom Coms. I haven’t seen all of his work yet Pattinson is clearly straying away from his fairly continuous (“Harry Potter”, “The Haunted Airmen”, “Twilight”) but not exclusive diet of fantasies to do Cosmopolis. Other than attempting to demonstrate range do you think there might be another message that he might be flirting with? I think Rob especially with Cosmo the roles are very dense character driven studies. I mean the material alone like Mission Blacklist are more complex and packed with philosophical ideas. He has shown with Cosmo this is more his element. O.K. Hold the phone!!! Are you claiming he has political and phillosophical side we weren’t seeing in the previous movies????? LOL! CR! What the hell? Where did u get that idea from what I wrote? Another one I can’t answer! I’ve only seen 4 of his films! I can’t even say I’ve read every book adaptation he’s done either (2 I think), lol! Does knowing the full plot count? I am going to attempt to answer your question the best way I can. This is purely my opinion. I don’t think Rob is trying to give a message to the audience with the types of roles he is choosing. I know some of how Rob came to be an actor, started at Barnes Theater Company, was seen in a play there by an agent and started to get work. Now I don’t know if any of the films that Rob shot prior to GOF (Goblet of Fire) were non-union or union films. When an actor is first starting out in the industry, it is common to start with films that are non-union, which means that the actor is not represented by SAG/AFTRA but they are covered by a basic contract. Their pay is smaller as well so non-union actors are mostly chosen because they are still “learning the ropes” and need to have something to build a resume. Most directors won’t look at actors unless they have prior experience because they need to know that the actor can take direction easily and be able to help the director/producer/whomever to sell the best product they can. or THEY COME HIGHLY RECOMMENDED BY SOMEONE. Once an actor becomes unionized they can only work on union projects their door to non-union is closed. So when Rob started he did what came at him but now that everyone is seeing him for his work ethic and the fact that appears to be gracious, humble and can attract an audience (mainly women) like moths to a flame. He can choose what he wants to do but he has said in an interview (I forget which one) that he lost a project because the decision makers believed him to be “tainted by Twilight”. IMO, that’s why he’s been seen in one genre but is now branching into other genres as well. I hope this all made sense. Thank U! Take a bow! Wow, that is very interesting Paris! Thanks for sharing it! Just trying to pass along my knowledge to help people to understand how the industry works. Yes! U even get extra sweet & sour sauce. Unfortunately, I have to go. This was fun as usual. Thanks all. Phenomenal idea OB. Great questions and contribution to this article. Have a good night CR! U did a wonderful job contributing research to this article. Of the topics covered which ones were u most fascinated by and why? 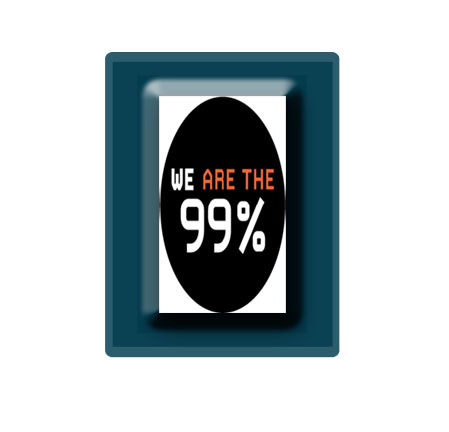 For me it was the Occupy Movement because it affects the nation and began to open the public’s eye to the greed that our economy is facing. ITA Paris- I ultimately believe social concerns influences art. At least it should anyway. The Occupy Movement for me too! That fact that Cosmopolis was written 10 + tears before the recession and it’s still an acurate picture of today is fasinating! You could swap the protesters in the book with the Occupy Movement and there would hardly be any difference between the two! I have to go. I really learned a lot from this series . Everyones contribution was great and I hope our readers get an opportunity to enjoy the other articles in this series on Cosmo.